Baby Boomers are getting older, and there’s no one-size-fits-all solution for their current or future housing needs. The active-adult, 55-and-over community has been popular with Boomers for years, but if their mobility is impaired or they develop other health issues, they may need to move to a senior-living community with multifamily housing and on-site health care services such as assisted living, memory care, and short- and long-term rehabilitation. According to “Housing America’s Older Adults,” from the Joint Center for Housing Studies of Harvard University, the number of households headed by adults in the 65 to 74 age range climbed 26 percent from 2011 to 2016, to more than 17 million. Furthermore, greater longevity and population growth mean the number of household members in their 70s, 80s, and 90s is going to soar; the Joint Center predicts that segment will more than double by 2037, a game-changer for the housing industry in the years to come. The good news is that senior-living projects are raising the bar already. Nursing homes of the past have been replaced by Continuing Care Retirement Communities (CCRCs), where different levels of health services are located on the same campus. Other communities offer only independent living, but residents can bring in outside resources as needed, such as physical therapy and home health care. In new senior-living communities, it’s not unusual to find hospitality-style services, amenities, and active environments, including multiple dining choices, educational and cultural programs, transportation to various retail and entertainment venues, and a plethora of social activities. Active-adult communities are changing things up as well, placing their emphasis on fitness, wellness, and the pursuit of lifelong passions. Compared with 10 years ago, lifestyle is “on steroids,” notes Deborah Blake, principal of The Ipsum Group, in Phoenix, who consults with active-adult housing developers. Take, for example, Boomer tourism nowadays, which often includes traveling with an expert who knows everything about a foreign country from political science and current events to religion and culture. And, the emergence of “lifestyle directors” in 55-plus communities who connect residents with amenities and activities keyed to their specific interests. Altis, a new 55-plus development in Beaumont, Calif., is tailored for the older Boomer that Blake describes. Altis is the first foray into the active-adult segment for Pardee Homes, a member of the TRI Pointe Group, and takes its cues from the four pillars of TRI Pointe’s Life360 platform: vitality, adventure, connectivity, and style. After intensive consumer and market research, Altis held its grand opening last November, attracting more than 2,000 people. Forty-two homes have been sold to date. When completed, Altis will consist of 704 homes, base-priced from the low $300,000s to the mid-$400,000s. Much like a concierge, a lifestyle director at Altis will help residents connect to a variety of opportunities both on and off site. “We’re working to curate that level of access before residents move in, which will be May or June 2019,” he says. Most 55-plus developers don’t finish community amenities until two or three years after home sales begin, but Pardee bucked that trend, completing The VuePoint, a 16,000-square-foot on-site recreational facility, and having it fully staffed before the community opened. “We believe [people] buy lifestyle before they buy a home,” says Sauls. Altis has a 4,500-square-foot resort pool as well as a heated, 2,100-square-foot lap pool with integrated therapy and accessible entry. The club includes pickleball courts, nearly 3,000 square feet of exterior covered patios, studios for everything from yoga and Pilates to massage, a bar, a fitness center, and a billiards and cards lounge. There are daytime activities and events for retired residents, as well as evening programs for those still working. The single-level homes have wider doorways, barrier-free showers, and a zero-threshold entry from the garage into the house. For buyers who want bathtubs, Pardee offsets them to create a 10-inch platform for easier transfer, a no-cost option. Sauls stresses the importance of building active-adult housing close to a full range of health care services. At Altis, a regional hospital, several urgent-care clinics, and other medical facilities are nearby. Part of the lifestyle director’s job will be to provide a conduit between residents and health care providers. Two Renaissance properties serve Sun Lakes, and a new project called the Robson Reserve is under construction to offer 224 units at PebbleCreek in Goodyear, Ariz. In addition to rental apartments for independent living, assisted living, and memory care, the Renaissance communities in Sun Lakes and Goodyear offer respite care: short-term stays for seniors who want to try out the community, whose caregivers are away, or who are recovering from surgery or a fall at home. Recognizing that older Boomers may be reluctant to leave the homes where they raised their children, Dallas-based Silverstone Healthcare Co. chooses locations for its luxury senior-living communities carefully. The majority of the people living in Silverstone developments today are well over 75, says managing director Tom Dwyer. “The best way for us to support that demographic is to maintain their personal preferences based on the location,” says Dwyer. People in this age group don’t typically venture beyond a five-mile radius of their homes and would find it difficult to adapt to a different neighborhood. Silverstone picks sites in Florida, the Mid-Atlantic states, and Texas that are in highly desirable areas near transportation corridors, dining, shopping, entertainment, and other services and amenities so that residents won’t have to give up their friends or choose different doctors and hospitals, he says. Silverstone opened its “new generation” assisted living and memory care community, HarborChase of the Park Cities, last April in Dallas. Operated by partner company Harbor Retirement Associates, the mid-rise community features 134 apartments and blends modern amenities with formal, private, and casual dining options, overseen by the former executive sous chef at the Four Seasons Resort. The amenities include a community activity room, a creative art studio, a game room, a wellness and fitness center, and a full-service salon. Every floor has unique social gathering and lounge areas. “We have to prove every day that we’re a better option for folks that are in their 80s,” Dwyer says. In the suburbs of St. Louis, Landwide Development Corp. is planning a mixed-use, market-rate, independent senior living community called The Prime Place. The development is within walking distance of a grocery store, hotel, movie theater, pharmacy, medical offices, and other amenities. It’s not a CCRC, but residents can bring in outside resources such as rehab services, physical therapy, hospice and home health, and private-duty nursing. The average age of The Prime Place residents is expected to be 78. The Blake at The Grove, a senior community in Baton Rouge, La., aims to make aging in place easier and more convenient, with independent living, assisted living, and memory care in one location. The Blake was developed by Cardinal Ventures, Jackson, Miss., and CR Properties, Hattiesburg, Miss., and designed by Humphreys & Partners Architects. McDaniel Wyatt, business development manager/Southeast for Humphreys & Partners in New Orleans, says the project is a delicate balance between connectivity of shared services; the main reception area, commercial kitchen, and back-of-house delivery; and the separation of uses. “The independent living experience begins from the moment residents arrive: entering the building through a separate, hotel-like lobby and coming home to an open floor plan that feels very much like a luxury apartment,” says Wyatt. The public spaces include bar/bistro areas for dining and socializing; heated pools and flex spaces for group health and wellness activities; and reading porches for a more private experience. In contrast, the assisted living and memory care areas are smaller and rely on shared services such as laundry and dining. Residents can use passive courtyards and private dining rooms to host family and events. The Dr. Davis Senior Residence in San Francisco demonstrates that housing for low-income seniors can have a positive impact on the community. A private residential wing with amenities and social services for residents is connected to a public community center with a gathering space and extensive programs offered to seniors from the surrounding area. Developed by St. Louis-based McCormack Baron Salazar and designed by David Baker Architects, of San Francisco, the Davis building comprises 121 apartments. The minimum age to qualify is 62, and the average age of residents is 72. 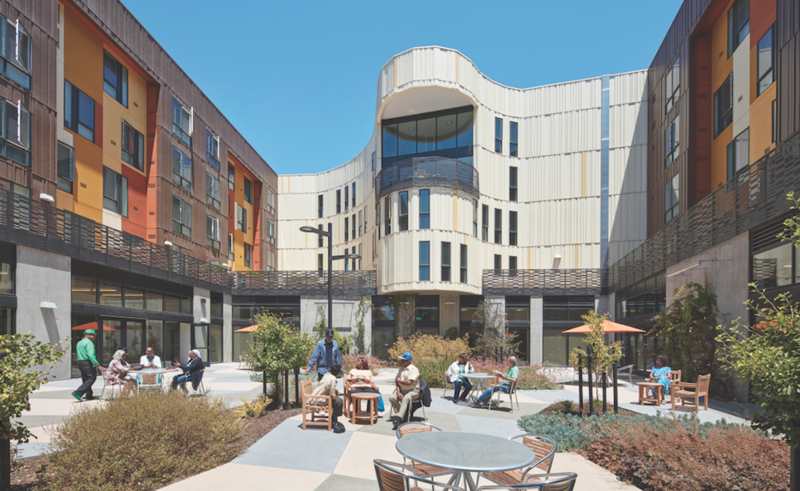 While 22 units were reserved for homeless seniors, more than half of incoming residents did not have a permanent residence before they moved in, says architect David Baker, FAIA, LEED AP. Recognizing the dire need for affordable housing and, increasingly, affordable senior housing, San Francisco’s Office of Community Investment and Infrastructure supplied the land. Bayview Hunters Point Multipurpose Senior Services runs the housing and senior center. Two wings with active ground floors are topped by four levels of housing. The wings connect via a curved central tower and open onto a shared central courtyard at the rear of the site. A private common room, event kitchen, fitness center, and beauty salon serve residents, as well as shared decks overlooking the courtyard from the second and fourth floors. In recognition of the project’s large African American population, the building incorporates African-inspired design elements such as the curved, natural, organic form of the tower; the earth-tone palette; and the textured façades. So what can be done for those in between? “Co-locating a public senior center or other senior-friendly amenities with senior housing would really help with aging in place and is a cost-effective model that might be possible for middle-income seniors,” Baker suggests. Sarasota, Fla., builder Josh Wynne’s father, Mike, has a degenerative condition that put an end to his working life some years ago. To keep his dad nearby while giving him privacy and dignity, Wynne designed and built a 604-square-foot cabin on his family farm. Nicknamed Mike’s Hammock, the home’s design fits within a palm hammock that was previously a pig pen. No trees had to be removed, which saved on land-clearing and landscaping costs. A deep covered porch, cantilevered beyond the foundation, faces west and overlooks an adjacent wetland, where his father can watch deer, birds, and sunsets. 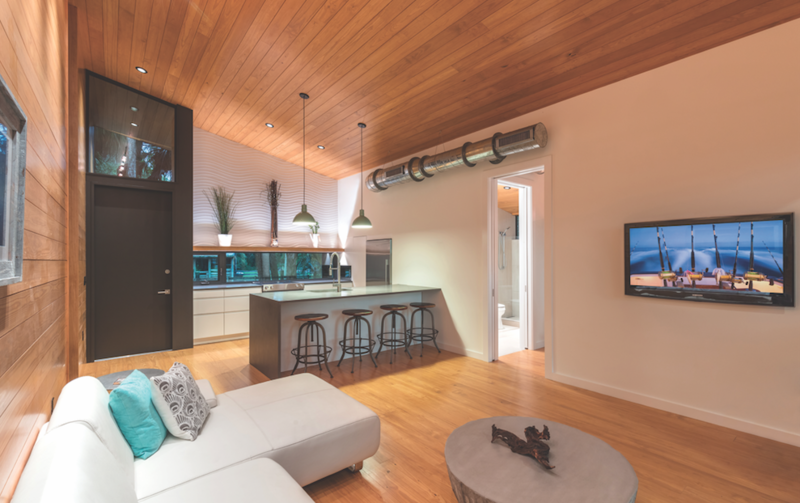 Wynne designed the cottage to standard material sizes and choices that lowered costs, eased maintenance, and resulted in a waste factor of less than 1 percent. Ninety percent of the materials were locally sourced. The exterior’s heavy-gauge, corrugated metal panels exemplify that effort. “It wraps the walls and the roof to break the perceived length of the structure and minimize maintenance,” says Wynne. Yellow pine runs through and up the ends of the house to stretch the perception of space and create visual interest. The full-size kitchen has IKEA cabinets with full-extension drawers for easy access, a hidden pantry, and a flush-mounted microwave. Wynne’s father is not in a wheelchair, but the home would be relatively easy to convert to full accessibility. Door widths are sized for a wheelchair, and the plan allows for easy navigation. With the exception of a small curb in the shower, every entry is barrier-free. 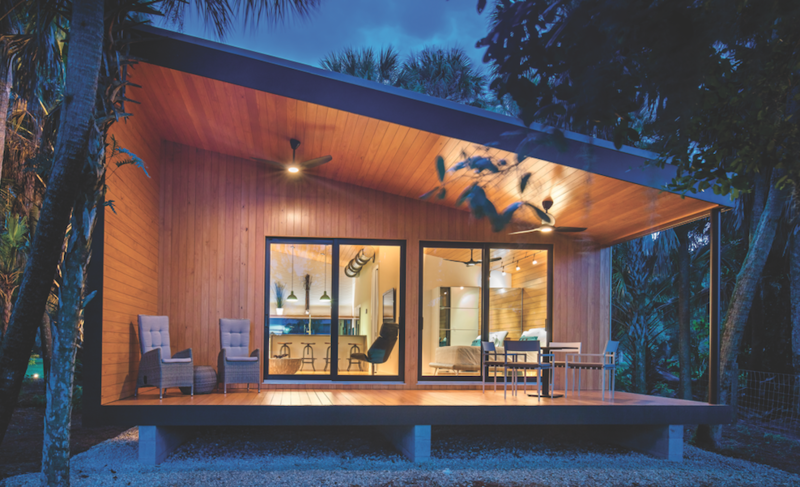 The home can withstand winds in excess of 160 mph and meets the large-missile impact requirements of the Miami-Dade County code. In fact, Mike rode out Hurricane Irma in the cabin, with the eye wall less than 20 miles away. A 30-foot tree fell on the house but did no damage.